In the "New Economy", the most important single asset for any nation is the intellectual capital it develops by educating its people well. Investment in education could not be better described than by the words used by the Chinese genius Kuan Chung centuries ago: "If you plan for a year, plant a seed; if for 10 years, plant a tree; if for a 100 years, teach the people. When you sow a seed once, you reap a single harvest; when you teach the people, you will reap a 100 harvests." KRL (Khan Research Lab in Kahuta, Pakistan) used to organize many international conferences on important technological and scientific subjects, usually covering those disciplines that were of direct relevance and importance to them. The aim of such conferences was to gather together a large number of participants from abroad to provide Pakistani scientists and engineers an opportunity to interact with foreign experts, exchange views, seek their guidance and initiate contacts with them for future studies abroad. These conferences covered such varied subjects as vacuum technology, advanced materials, phase transformations, software engineering, fluid dynamics, super conductors, magnetic materials, mechanical vibrations, and biomedical sciences. It also enabled Pakistani scientists and engineers to present their research papers in the presence of foreign experts, which gave them self-confidence and enabled them to learn from constructive criticism and advice. The conferences attracted professors and experts from countries including Austria, Bahrain, Belgium, China, Egypt, Germany, Holland, India, Japan, Switzerland, Turkey, the UK and the USA. It was an extremely healthy exercise which, unfortunately, has since been discontinued. When I started our enrichment program in 1976, and later the weapons program in 1981, I found out that the standard of our graduates was far below that of European graduates. Not only did they lack in basic knowledge, but there was also a severe dearth of self-confidence. I selected those I considered to be the best for my initial team and, thanks to their dedication and willingness to learn, we managed to complete the program in a relatively short span of time. I still vividly remember how, during one of the interviews, we ran into a cocky physicist who was all out to impress us with his brilliant educational record, having secured first position every time and being on the Honor Roll in the M.Sc. physics programme at the Government College, Lahore. I just listened while my colleagues did the questioning. At the end I asked him to show graphically the linear relationship between two quantities. I was shocked by the fact that he was unable to do so. I then asked him how he would determine by a simple experiment whether or not a small piece of wire was a conductor or a semi-conductor. Again we drew a blank. Years later, there was an annual get-together of old Ravians where I was invited as chief guest. The late Dr Arif (advisor to the late Chief Minister Wyne), the late Mr Hanif Ramay (a former chief minister), Mr Majid Nizami and other Ravians paid tributes to their Alma Mater, claiming that the affairs of Pakistan were being run by Ravians. I could not help remarking that Pakistan's condition in all spheres did not speak highly of their performance. While studying in Germany, Holland and Belgium, we visited many industrial units and other universities to broaden our vision. In my case, I visited such industries and institutes in Germany, Holland, Belgium, France, England, Austria, Italy, Sweden and Denmark and gained invaluable knowledge and experience from it. I would like to do justice to the graduates of the various institutions by stressing that the fault was (and is) not theirs. It is the outdated system and lack of facilities that hold them back and prevent them from becoming well-equipped and well-informed. During one of the conferences mentioned above, a British professor asked what the monthly fee at a public university was. When informed what this nominal amount was, he quipped: "Well, you can see that from the end-product." One serious defect in our educational system in general, and our scientific and technological education in particular, is that most of it is based on rote learning. Also, facilities are inadequate. For the greater part, studies consist of memorizing the answers to question papers of the past five years without any attempt to encourage comprehension of the subject. After graduating from this system, students have not fully developed their natural talents. The high school exam is a tough nut to crack because of the number of subjects. As one proceeds into higher education it becomes relatively easier because the subject matter is more limited. This has resulted in a number of cases of fake high school certificates followed by genuine B.A. and B.Sc. degrees. After an M.Sc. degree from a Pakistani university, studying abroad for a Ph.D. becomes a question of time and some effort. In most cases the supervisor and other doctoral students help, especially if the student is from a Third World country. A Ph.D. degree is obtained while acquiring a lot of knowledge on a very limited subject. Since the foundation was weak to start off with, subsequent building blocks cannot be expected to be solid and strong. In order to overcome this deficiency, we had initiated a novel program at KRL. We recruited the best B.Sc. degree holders available and then sent them to the UK to study at good universities to obtain B.Sc.(Hons.) degrees in various disciplines. This basic grounding gave them the solid foundation required. Some were allowed to continue for an M.Sc. degree, came back, worked for a few years and were then again allowed to go for Ph.D. work. Although this was somewhat costly in financial terms, these engineers and scientists turned out to be great assets to us. They were not only competent, but did not hesitate in taking initiatives. The principle behind this was taken from my own experiences. I had gone to Germany after completing my B.Sc. I obtained a thorough grounding for five years before earning an M.Sc. Technology and then went on to complete a doctor of engineering degree. It was this solid base that later enabled me to handle the most difficult and complicated enrichment and missile programmes. Coming back to engineering education, I would like to point out that engineering is a diverse, wide-ranging profession offering challenging careers in a wide range of areas. One should realise that, within any area of engineering, professional engineers are involved in a wide range of different activities such as design, research, development, production and marketing. Only engineers with good qualities, abilities, skills and initiative to a high level of technical expertise can cope with such a challenge. A very serious shortcoming in the development of the capabilities of our engineers is the absence of industrial training during their studies. When I went to Berlin, it was compulsory to have at least six months of practical industrial training before joining the university. In my particular case, I had spent three months at Siemens in Karachi and then six months in Germany, working during the day and learning German in the evening, as all courses were taught in German. Having acquired that practical experience even before starting my studies was an invaluable asset. Unfortunately, this practice is not followed in Pakistan as most industries don't offer such facilities. Our government should make such practical experience compulsory too, either before starting studies or during the course of the studies. I have heard that this is indeed the practice at some universities, but I was unable to confirm it. For both scientists and engineers there are always challenges to face and to solve, laws of nature to be determined and items of use to humankind to be invented and produced. Some of the things that are of daily use in our life now seemed impossible a generation ago. This was aptly expressed by Robert H Goddard in these words: "It is difficult to say what is impossible for the dream of yesterday, is the hope of today and the reality of tomorrow." Investment in education could not be better described than by the words used by the Chinese genius Kuan Chung centuries ago: "If you plan for a year, plant a seed; if for 10 years, plant a tree; if for a 100 years, teach the people. When you sow a seed once, you reap a single harvest; when you teach the people, you will reap a 100 harvests." In my last article I had mentioned the invaluable advice given by the great Muslim scholar Yaqub Ibn Ishaq al-Kundi, that one should not be ashamed to ask questions to determine the truth and to acknowledge this fact without any hesitation. Riaz this reader is beginning to wonder if you have a political axe to grind. Do you know what plagiarize means? Do you know when the original nuclear technology was developed and where? It was America's Manhattan Project under Oppenheimer. By your definition of plagiarism, every scientist in every country that has developed nuclear capability after the US is guilty of plagiarism. Every scientist and engineer today that develops any thing stands on the shoulders of giants before us. "Political ax" you say? I think you have that ax to grind, not me. Because you brought the politics into a non-political discussion. Do you know what plagiarize means? Wait - maybe "plagiarize" is too mild a term. The appropriate word is theft. I think you have that ax to grind, not me. Because you brought the politics into a non-political discussion. Using AQ Khan's opinions to make a point begs the obvious question of credibility of the source. If you're going to shove that under the carpet there's no meaningful discussion to be had on the subject matter itself. You say, "Wait - maybe "plagiarize" is too mild a term. The appropriate word is theft. " This allegation of theft has been applied to Britain, France, Russia and China when they developed their nuclear technology. In fact, Oppenheimer was accused of transferring technology to America's enemies. This is nothing but racism that assumes that others are incapable of developing anything on their own. Read "India's Nuclear Bomb" by Perkovich in which the author talks about the intolerant pride of the Brahman caste that first "dismissed" and then was "shocked" to learn that Pakistan had extensive nuclear and delivery capabilities. In all likelihood, BJP would not have proceeded with testing the bomb, had they known that Pakistan was equally capable and serious about maintaining deterrence that would neutralize India's conventional superiority. Its shameful that you had to mention AQ Khan as an example.I am stunned at your audacity to argue for this guy.Much as you argue that-every country has involved in theft-you shall not have any excuse if you support the fact this guy had made the world unsafe by running nuclear walmart!!! !There is a limit to national pride and there is limit for religious insanity when you stoop to support this evil fellow.Unbelievable!!!!! (By the way Pakistan is not India or Britain in its credibility or stability-try to look to compare with some religious nation with "islamic" credentials). You argue, "Its shameful that you had to mention AQ Khan as an example.I am stunned at your audacity to argue for this guy"
I can sense your emotions are running high. Dr. AQ Khan is a highly controversial figure. His sins of nuclear proliferation for personal enrichment are unforgivable. But his contribution to Pakistan's security must not be overlooked. 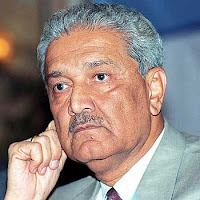 If Pakistan lacked the nuclear arsenal and the missiles it now has thanks to AQ Khan, India would have absolutely devastated Pakistan in the wake of Mumbai. Let's not lose sight of the man's contribution to Pakistan as we excoriate him for his personal failings. India would have been punished by international community if it even thinks of using nuclear weapons-no excuses.No question of tolerating nuclear indiscipline.This is not about India and pakistan -this is about lack of values due to which this rogue Khan bought himself down!. You say, "India would have been punished by international community if it even thinks of using nuclear weapons-no excuses." India, with its superiority in numbers and conventional weapons, would not need to resort to nukes to destroy Pakistan. The only thing that deters it is the fear of Pak nukes. This fear has prevented wars in 2001/2 and again in 2008/9. Riaz - You know the art of attracting these super bigots ;-) Anything that prevents these fanatics from expanding on their desire to be a regional bully becomes rogue and eveil, be it AQ Khan, Army, ISI, or Taliban. Khan does have valid points - He points to some weakness in Pakistani education system that I have also noticed (and experienced). European students certainly have a better "engineering sense" and are more practical compared to local kids. Although, student involved in Co-Op programs here do better in their profession. I think if opportunities are provided, Pakistani students will also do well. The main problem that Pakistani students face is the lack of role models in the universities they graduate from. There are big differences between the American and European model. German model, for example, has heavy emphasis on industrial training. And yet, the world's top universities are in the US and the biggest innovations have come from America in the last century. I think the more basic question is the emphasis on scientific reasoning versus learning facts. As Dr. Khan points out, Pakistanis are brought up with rote learning. That has to change to make them better in the fields of Science and Technology. I would like to correct that its not Pak's nukes that deter India after Mumbai. That is ridiculous..its not a one way street..the nukes I mean.Pak has clearly defined thresholds..India was deterred by Pak's using ballistic missiles armed with conventional warheads targeting economic targets in Gujarat,Bombay etc.This problem is being fixed with rapid theater ABM testing and deployment.. Did you read about a news story that the 1990 China's nuclear test was for testing a pak nuke device? Jadev says "I would like to correct that its not Pak's nukes that deter India after Mumbai." 2. Poor countries like sudan, somalia, afghanistan fighting and dying in the name of islam. You could ask the development of pakistani intellectual capital to the taliban who has already moved into swat and further moving inside. Dear Riaz Haq shahab ,at this time country need your services & your un matched experiences why your are away from country border & just only writing about the defects of the nation ,come & establish think tank as you are experiences last 30 decades in USA ,come & provide a plate form for intellectual who can solve issues of this country in a meaning full manner .We need you and your experience to establish think tank . Come & share your experience with us . ABC’s Nightline program sometime back was as usual a pack of distortions about a country that remains steadfast in its support for the US. Entitled ‘The most dangerous country in the world,’ the program focused on the emotional outbursts of a diehard segment of Pakistan society and the fulminations of misguided pacifists known for their opposition to Pakistan’s nuclear program. It conveniently ignored the country’s march in different fields and the progressive nature of Pakistan society. It was a willful and wanton attempt to smear the image of Pakistan. Yet, there was one positive comment that seemed to have unwittingly slipped from Ted Koppel’s lashing tongue: Some of the world’s best schools are in Pakistan! As the compliment was paid - grudgingly or ungrudgingly - the ABC camera panned across a classroom full of young boys and girls. Their uniforms looked familiar. Was it a Beaconhouse School chapter? I was not sure. Yet the compliment - ‘some of the world’s best schools are in Pakistan’ - reechoed in my ears, and justifiably so. My own son, Jahanzeb, had studied at the PECHS Chapter of Beaconhouse. He was later to win a full university scholarship and excel in studies on migration to the US, thanks to the excellent school education he had received in Pakistan. Blissfully, the Beaconhouse School System has seen a marked growth in recent years. Its branches dot the country’s landscape and their number is fast multiplying. Founded by Mrs.Nasreen Kasuri and Mian Khurshid Mahmood Kasuri, the System is the largest private network of schools with 40,000 students This wholesome trend testifies to the fact that private schools today play a complementary, nay, catalytic role in strengthening the education sector in Pakistan. They have a chain reaction effect and in this enterprise Beaconhouse’s example stands out, thanks to the painstaking strivings of Mrs. Kasuri who has been at the helm of the School System since its inception. In a recent book "Abundance", author Peter Diamandis argues that that advanced science is becoming much more accessible to a wider number of people through movements such as the world-wide DIY movement spurred by better low-cost tools and technologies for things such as "bio-hacking" and development of artificial intelligence. It's no longer an exclusive preserve of a few elite scientists in multi-million dollar labs. 1580 students were awarded degrees, while 39 were decorated with medals in the 14th convocation of Pir Mehr Ali Shah Arid Agriculture University Rawalpindi (PMAS-AAUR) here on Thursday. 28 graduates got gold medals, seven silver medals, four bronze medals, while 14 students got PhD degrees. Dr. Mukhtar Ahmad, Executive Director, Higher Education Commission was the guest of the day while His Excellency Choongjoo Choi, Ambassador of South Korea was the Guest of Honor. Prof. Dr. Rai Niaz Ahmad, Vice Chancellor of PMAS-AAUR was the chief guest on the occasion. Dr. Mukhtar Ahmad, Executive Director, Higher Education Commission, said in his address that the Universities’ faculties have great potential and HEC is trying its best to provide all opportunities to facilitate them. He said HEC would continuously support institutions of higher learning. Dr. Mukhtar congratulated the graduates and expressed the views that the students are the future of Pakistan and “can make Pakistan prosper through the art of education andtechnology. It is the dire need of the time to promote education at higher level in the country and universities are source of creation of new dimensions in the field of research &knowledge.” He emphasized that students must contribute for the development of country. He also lauded the efforts of the University administration for research based education. Prof. Dr. Rai Niaz Ahmad, Vice Chancellor, PMAS-AAUR in his address said that University stood 7th in HEC ranking out of a 116 universities of Pakistan whereas among agriculture universities PMAS-AAUR achieved 2nd position. He further said that last year the university started two new degree programs BS Forestry and Ph.D. Computer Science, in addition to this various short-term training courses were also arranged for the farmers of the area to strengthen the ties between the university and the community at large. Dr. Ahmad also asked the gathering to create favourable environment for research, brace cooperation with national and international R & D organisations. While sharing the future plan, Vice Chancellor said the university administration is going to establish a new Faculty of Agriculture Engineering and Pak-Korea Capacity Building Centre for Agriculture & Livestock Technology with the help of Korea International Cooperation Agency (KOICA). The total cost of the project is US $ 3.5 million, he concluded. His Excellency Choongjoo Choi, Ambassador of South Korea, offered assurances that the Korean Embassy would do its best to enhance the development of Pakistan. While discussing agriculture and livestock he said that these are the backbone of a country and students must play their role in the agricultural development of Pakistan.